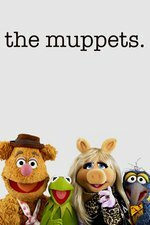 Miss Piggy receives a "gift" from the annoyingly perfect Christina Applegate, Kermit avoids talking to Fozzie because of a terrible sketch and the situation escalates to the point Nick Offerman has to replace him, while Gonzo has a situation with his online dating profile and Pepe, Rizzo, and Liam Hemsworth help him out. - There's no chance he'll think I'm a baseball trophy, is there? Rowlf owns a bar now, if anyone wants to know why he's not on the "show". - Kermit is like the third most common frog name in America! -I'm off the grid! You'll never find me! Sam disapproves of Fozzie's humour. But at least he keeps it clean. But not funny. - Have yoooou been sshot with a tranquelizer dart, kermit? Liam Hemsworth looks like a muppet, so he was perfect. True story: the very first time I ever met my wife, we were in the car and as we came to a fork in the road I instructed her to tell me to "Bear Left". She did, and I replied "Right, Frog!" She says that is the moment when she knew we were destined to be together. 29 years in December. Best joke of the ep, but the little throwaways from the Electric Mayhem guys keep scoring, too. I didn't like the "I.T. guy" Muppet. He just looked wrong, like "what is this non-Muppet doing on the Muppet Show?" Glad to see Rowlf back. Hoping for more appearances! "Is this where I go to her?" "No, this is where you go home." -Lost in touch with reality? -Yeah, and speaking from personal experience, you never quite get it back. He looked something out of Crank Yankers. Not crazy about the "lolnerds" BBT-style comedy, either. The IT guy -- the way they designed his eyes, when he blinks, only the pupils blink. It's surprisingly off-putting. He looked something out of Crank Yankers. Chip apparently originally appeared on The Jim Henson Hour in 1989. Is there a name for Muppets who are Muppets and the ones who look sort of human like Chip or Gonzo's date? I don't like them, they seem too uncanny valley and disrupt the visual comedy of human actors talking seriously to a one foot tall rat and a six foot tall eagle. The Swedish chef didn't trip that same dissonance, I think because he's always in costume and looking similarly surreal. Just- the Liam scene would have been so much funnier if the date hasn't been a vaguely pretty little female humanoids Muppet, but a full on furry prawn-tentacled Muppet starring soulfully into his eyes. Wow, no more Chip, please. Not only is he disturbingly close to a human and unlike all the other Muppets, but the jokes about him seemed sort of lazy writing based on stale stereotypes of computer nerds. That joke about being taught direct eye contact meant someone was talking to you? Was that an Asperger's thing? I don't know I really disliked the Chip character and his weird pupils and lidless eyes. Whew - now I can get on with saying this was the first episode where I felt it the show was hitting its stride: the guest stars really worked, the plots wove together nicely, and we got Miss Piggy's toy poodle (hooray!). Applegate gamely shoving her face in the cake was very funny too (you can see she face-planted and then smooshed in further! :D). The eye situation with Chip is annoying but for reasons I can't fully explain it was the lack of ears that bothered me every single time he was on screen. WHY DON'T YOU HAVE EARBALLS, CHIP? Ugh. I'm borderline annoyed that they don't have Gonzo trying to date chickens. Surely they could come up with a chicken dating website for laughs. I'm enjoying all the Floyd and Zoot banter as well as the Janice stuff. I'm borderline annoyed that they don't have Gonzo trying to date chickens. His relationship with Camilla has been such an integral part of his character for so long I'm surprised they haven't acknowledged her absence yet. Less Chip, more everything else. Ron Swanson as a replacement bear seemed on point. So much this. And The Office (UK) did the "IT guy" guest character much better. Sam The Eagle's voice seemed WRONG in this episode. My other complaint, too many cameos per episode. One celebrity only would feel way better. Though I realize there's probably scheduling constraints there. How expensive do you think this show is to make? I can only imagine the multiple cameos have something to do with demand. Wouldn't you like to spend a day screwing around with the Muppets?